“The danger to America is not Barack Obama but a citizenry capable of entrusting a man like him with the Presidency. It will be far easier to limit and undo the follies of an Obama presidency than to restore the necessary common sense and good judgment to a depraved electorate willing to have such a man for their president. The problem is much deeper and far more serious than Mr. Obama, who is a mere symptom of what ails America. Blaming the prince of the fools should not blind anyone to the vast confederacy of fools that made him their prince. The Republic can survive a Barack Obama, who is, after all, merely a fool. It is less likely to survive a multitude of fools such as those who made him their president. Often attributed to Thomas Jefferson. Though these exact words do not appear in his writings, this is Jefferson's sentiment, exactly. These words also appeared in Henry David Thoreau's Civil Disobedience. From Ralph Waldo Emerson's essay Self Reliance. "The head monkey at Paris puts on a traveller's cap, and all the monkeys in America do the same." From Henry David Thoreau's Walden. Benjamin Franklin, from On the Price of Corn and Management of the Poor, 1766. "Ain't nothing better than riding' a fine horse through a new country. That's exactly what me and Woodrow was meant for." From Lonesome Dove, 1989. Capt. Augustus McCrae, Texas Ranger, spoke these words while riding with young Newt near the Powder River in Montana as the Hat Creek Cattle Co. pushed on to the Milk River. "I have never been lost... but I will admit to being confused for several weeks." Margret Thatcher made this statement in various forms at various times. From The Girl from Petrovka (George Feifer, 1971, p. 66). Capt. Augustus McCrae, Texas Ranger, in Lonesome Dove, 1989. "The act of reaching into one's own pockets to help a fellow man in need is praiseworthy and laudable. Reaching into someone else's pocket is despicable and worthy of condemnation." "If we wish to be compassionate with our fellow man, we must learn to engage in dispassionate analysis. In other words, thinking with our hearts, rather than our brains, is a surefire method to hurt those whom we wish to help." "He who does not work, will not eat." Comment by SJT: This does not mean that those who cannot work should not eat. Compassion is good, of course. But if someone is able to work and chooses not to, they should experience the consequences. "I've never let my schooling interfere with my education." "Liberalism is a mental disorder." "God is great, beer is good, and people are crazy." "You can't have no idea how little I care"
"Now that's a damn snake!" 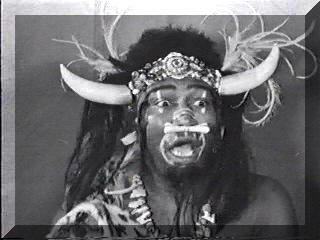 Uncle George, the Wild Man from Borneo, from The Little Rascals.